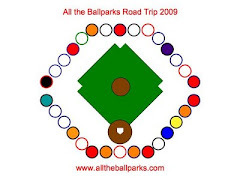 All the Ballparks: Happy Birthday, Mom!!! Today, July 14, 2009, is Mom's birthday. Originally she was to join us in Atlanta for her birthday and to go to the Braves game on the 16th, but she got stuck working. At least it is something we knew about not happening a while back and instead she was able to join us for the Cardinals game back in June. We are sorry she is missing the World of Coke with us today, but are thankful she stayed home to work and paid for our trip. Well, Mik might not me so thankful about him ending up on what he calls the Summer of Hell, but he loves mommy just the same. Since we will not see her on her birthday, here is a photo of her present that she will have to wait until August to get. Mik spotted the Chicago Bears gel candle when we were at the Jockey Lot Flea/Farmer's Market on July 12th. I had already spotted the Coke glass gel candle when he spotted the Bears one. Instead of choosing between the two we just got both. Later at the grocery store Dad saw a card that he thought was funny. 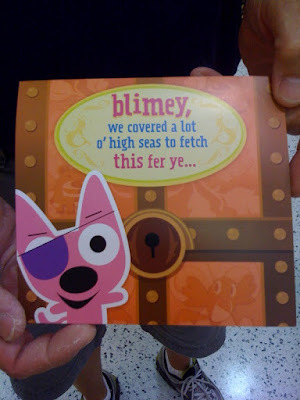 It says "Blimey, we have covered a lot o' high seas to fetch this fer ye..." It is a good one since we got Mom's birthday present 13,000 miles into the trip and there is still about 9,000 more miles before it gets to her. However, it was a music card and I did not let Dad spend $8 on a card.